← Congratulations Week 11-16-15 & 11-23-15 Giveaway Winners!! I write contemporary romantic comedy. I think this genre is a natural extension of myself. My fingers just fly and I let it roll out. I really love getting down a dirty first draft. I work and work until I’m sick of the story. Set aside and move on to a new project. Then I go back and work some more. It’s slow, but what works for me. I’d probably work in retail, like an antique mall. I like old things. Breakfast. I eat half a grapefruit, small glass of milk, and half a bagel just about every day. But if there’s bacon….yum. Truly, I like writing both. I like figuring out what makes each tick, their secrets, and imagining what they look like. The quirkier ones are usually the funniest. I’m already Batman; so I do have great toys. However, if I wasn’t Batman, I’d bring peace to all. I’m happy at my desk at home. During the day, there’s quiet. I have lovely scenery outside my window. Squirrels and birds hang out in the bushes. It’s really lovely. Once, I got a contest score back and a judge had written “why do you write?” I sobbed. And sobbed. Then two days later, I decided that no one can define me, but me. So I got back to work. So ultimately, the judge did me a favor. At RomCon, a young lady came up to me in a shy way and said she had read everything I’d written. That gave me tears too. In 2016, The Wild Rose Press will be publishing Temporarily Insane. This romantic comedy mystery picks up from Temporarily Employed. 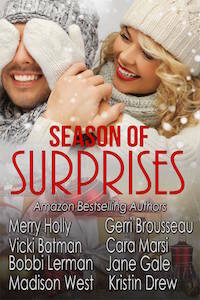 Be sure to come back to read more about Vicki and her story, “Holiday Handbag Extravaganza, in the SEASON OF SURPRISES HOLIDAY BOX SET, on Wednesday’s Karen’s Killer Book Bench. Happy Reading! Links to Vicki’s website, blog, books, etc. Thanks, Vicki, for sharing your story with us!! Good morning, Vicki, and welcome back to Karen’s Killer Book Bench! I do love your last name. It’s fun, and I’m sure the main joke in your family. 🙂 Your books are such fun, too. Looking forward to sharing your excerpt on Wednesday! Hi, Karen and thank you for hostessing me today! I love telling everyone I married a superhero. LOL. Most people wonder if Batman is my pen name, but no, it’s the real thing. Have to admit, I’m a huge fan of romantic comedies, so they’re the ones I’ll be checking out. I think they’re really visual. When I’m reading one, I can usually imagine it as a movie. Loved your interview…your personality bubbles through. Hi, Sharon! I am a huge fan too! I remember reading my first Janet E. and thinking “finally.” Finally, there was someone who wrote funny. I felt as if my funny writing was suppressed for a while because romantic suspense and mysteries–a favorite genre–is usually darkish. Oh thank you so much! I’m glad I have personality. LOL. Honestly, I was so shy when younger. Hi, Jacquie! You are so sweet. And good wishes your way too. Thanks, Karen and Vicki….had not met Vickie before but will most certainly do so now! Hi, Kathleen! You made my day and thank you. I can’t wait to get to know you. So wonderful to get to know you better, Vicki. A great interview! Hi, Stanalei! I love interviews because we get to know authors better. Thank you so much for stopping. Hugs! I love learning more about you. I’m excited that your sequel is coming out soon. Temporarily Employed was so funny! Temporarily Insane! Love that title! Hi, J! Making up stories is too much fun. So far, I have another book and three stories ready-set-to go. I’m sure a few more will sneak in. LOL Thank you.